Ancient Greek meal today! (Well, I mean based on food they might have eaten in Ancient Greece, not an ancient meal. ha ha ) Our girls studied Ancient Greece this last semester, and they enjoyed learning about the culture. In particular, the book Archimedes and the Door of Science (Geanne Bendick) brought the ancient Greek culture to life. (I enjoyed it as much as they did!) So, we are celebrating with a Greek meal, including lentils. We’re also doing hard-cooked eggs, in our second Hot Pot. 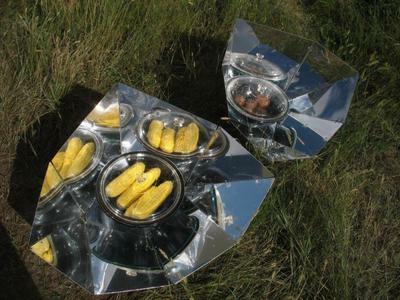 Seems appropriate that we are using solar science to cook our meal, since the ancient Greeks loved science! 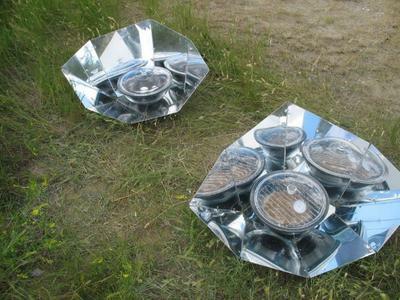 9:00 am—3 T olive oil: put in Solar Hot Pot, cover, set up facing the sun, set timer for 20 minutes. 9:20 am—onion & garlic: add, stir into oil, cover, set timer for 40 minutes. 10:00 am—1 1/2 c. water and 2 c. dry lentils (no need to soak beforehand): add. Put baking rack in top of Pot to hold thermometer for easy reading. Cover, adjust to sun, set timer for 60 minutes. 11:00 am—adjust to sun, set timer for 60 minutes. 12:00 pm—check for doneness by scooping a few lentils out of the center of the Hot Pot. If not done, keep checking every 30 to 60 minutes (but don’t let food sit for more than 2 hours under 150 degrees Fahrenheit, for food safety). We had quite a few clouds come through, and our lentils took 3 hours and 45 minutes. But they reached 150 degrees Fahrenheit in less than an hour and only dipped to 145 for about 15 minutes after a bunch of clouds had been covering the sun. And in that case, you will probably need more water. If we do lentils again, I’ll probably start out with the 1 1/2 c. water and keep an eye on it; maybe add more hot water in the afternoon. The eggs were in the Hot Pot about 3 hours and 15 minutes. 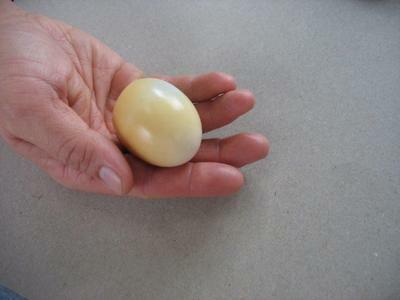 That one egg stubbornly refused to get brown spots, but it was done, too. And by the time we took them out with the rest of them having THIS many spots (a little over 3 hours), the actual egg whites turned brownish! 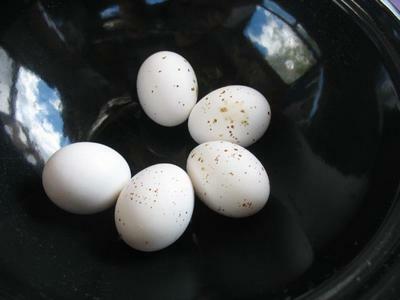 They tasted great—like slightly “brown”-flavored hard-cooked eggs. I liked the flavor a LOT! Okay, now in go potatoes for supper, and later corn-on-the-cob after we wash out the lentil Pot. The potatoes took about 3 1/2 hours of partly-cloudy-summer sun (1:30 to 5:00). For the corn, we put 1/2 c. water in the other Hot Pot around 2:30 to preheat, added the corn around 4:30, and it was great a little after 5:30. ...The other photos are in the next submission since only four at a time can be uploaded.